The 1930s gave all of the tank-building countries very false hopes for their antitank guns, as in exercises the antitank guns were frequently rated able to knock out any tank they faced regardless of battlefield conditions or armor protection. The British 2-pounder, a 40mm weapon very similar in concept to the US M3 37mm, the German PaK 36 3.7 cm, and the Soviet M1932 45mm, seemed like a good idea in 1939 but soon found itself outclassed in combat. Added to that was the over-engineered mounting for the 2-pounder which made it heavier and more difficult to use in action than the others (lower, simple split-trail carriages). Gunners soon used to not raise the upper shield and fire the gun from its wheels with the front spades raised in order to provide a modicum of mobility. Later on in the war the guns were fitted to 6-pounder type split-trail carriages (Mark 10 gun on Mark 4 carriage) and a semi-squeeze bore projectile was offered with a squeeze-bore adaptor as the “Little John”, which got a bit more mileage out of the gun against German light armor. Also fitted as the standard tank gun on the A13, Crusader, Valentine and early Churchill tanks as well as most armoured cars, the 2-pounder was also quickly replaced by the 6-pounder on the latter three tanks and the later armoured cars. 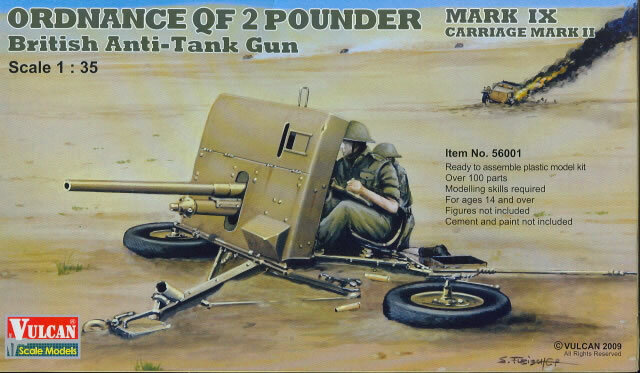 For many years the only kits available of 2-pounders were either white metal or resin, expensive and mostly not very good. It wasn’t so much that the manufacturers were poor as the gun was very complex and difficult to mold or cast. The kit provides the Mark IX gun complete on the Mark II carriage with nicely done wheels, using the now-common method of “sandwich” construction to both avoid seams and provide tread depth. Each tire consists of two sidewalls and three “tread” sections. Wheels are in two parts with a dished “hub” side and a ribbed rear side. The gun proper comes with a “slide molded” barrel and even offers a poseable breech block. The shield comes as a single piece but with some care may be separated to simulate the folded section for travel or the “lessons learned” combat deployment to reduce gun height. The very petite lower carriage comes with tie rods, a handling spike, and separate mounting arms for the front spades which may be fitted as folded for travel or late combat or down for early combat positions. The kit comes with two ammo boxes with separate lids and separate round casing bases so the modeler may portray either a full or empty ammo box, or anything in between. Accessories also include a sight case and ready ammo box for the gun as well as six “live” rounds and six empty casings, also with “slide molded” open throats. No decals are included, but as these guns had few markings it is not a major problem.